To take part of the race please register to the championship and [b style="margin: 0px; padding: 0px; color: rgb(34, 34, 34); font-family: Arial, Verdana, Tahoma, sans-serif; font-size: 12px; line-height: 16px; background-color: rgb(232, 232, 232);"]place your allocation for the race[/b]. Corner cutting is not allowed. If, for example, you cut a chicane going straight on the grass/sand, give back the time you gain, and give back positions if you overtook someone. It's allowed to go slightly off track, for example on the green extensions. 4 Tamburello: allowed to go on the green extension. if you go even wider you will loose time on the sand, therefore it's tolerated. 6 Villeneuve: allowed to go on the green extension. if you go even wider you will loose time on the sand, and the wall is close enough, therefore it's tolerated. 18-19 Rivazza: allowed to go on the green extensions. if you go even wider you will loose time on the sand, therefore it's tolerated. to make it clear for everyone, it's allowed to go with both wheels on the green extension, but not going beyond. So no tires should touch the grey area. The orange car lap is valid. If you go wider than the orange car, please lift off. The car with the red arrow is way off. If by mistake you go too wide, make sure you don't gain any time. I realized that this running made left a championship, and on the other hand on the list of the participants I see that Marteen is in green list, therefore not having participated in 2 premiere shopping and not being sure to participate in the remaining coursex, I shall in no way want to unsettle this championship, by respect opposite pilots participating in it, and who struggle for earning it! therefore this evening I shall not be among the starters! I had a good time well in the ranking it is perfect!!! again not enough training for this event. Sorry Giancarlo about my mistake in race 2 but I had a lot of problem with my load cell braking and after fews laps after the contact had to leave the event. I hope I could solve it for next event. For me ' first podium in a group A race . I had podiums an victories in group B races (not to difficult, especially when there are/were incidents in front ), but in group A -with all those 2-4 aliens- a pos.4 result had been the maximum before this event. 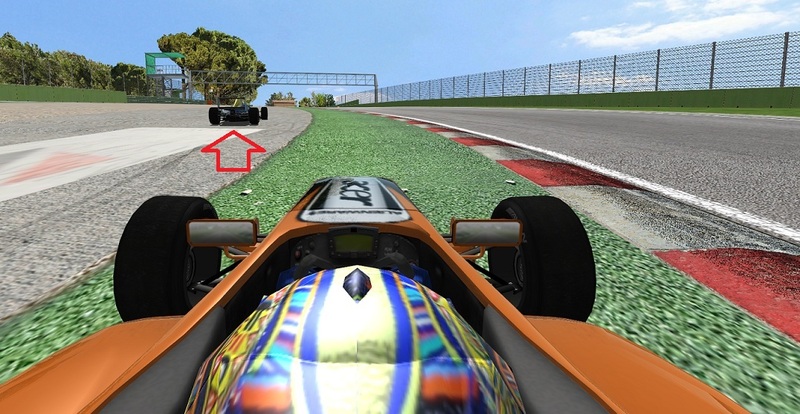 I improved my setup, which I also uploaded on the rank back then, used at the previous held event here at Imola with F2000 in some tiny details (still even less wings, another camber, toe,.. setting), that of course paid off. Qualy was ok, but I found my driven laps not really satisfying, because of a bit of traffic and tiny mismatch of speed in t1*. I aimed for s.th. like 1m40.4-6 originally. So only the first hotlap was acceptable, but not at 'total' limit. *Recorded the event with fraps again and so especially in t1 I did not have a fluend enough speed-feeling there at some of my first laps and being too slow there at the begin of one of my very last qualy laps. Then the races worked quite fine. Maybe the driver behind me at the race2 start was a bit too agressive -not for the first time- (since I was quite 'far' in front of him before t1 and very close to Gek and Orsetti..), no huge incident happened luckyly., but that thing caused a bit of trouble for some of the drivers directly behind I think. But that would be a case for a small pm, to clear this general situation a bit up there.. . Still fair, controlled and so on, but a little too 'hara-kiri' from one driver. Quite consistent in laptimes at every stint. At the pitstop I lost 8 sec., because of 1.) the two drivers in front pitted on the same lap, so at arriving I had to 'wait', before being able to aim at my box, to let Gek go on at first (just for a short moment) and especially 2.) I stalled the engine once at leaving box, because of being not in N (neutral). But that lose of a few seconds was not a problem, just to mention also this tiny detail. Olivier Boissel wrote: Hi all. I call race incident no more. see U next..
thanks to all for a great runnssss! I missed this event, because i had some connection trouble and when i joined with 14 minutes of qualy to go, someone had taken my spot in group A. Not very nice, as i took some time off work to join you guys. Not amused. hey Maarten, I was going to send you a PM about it, since I've seen what you wrote in chat. I'm really sorry that you missed the race. We've been waiting for you in the STAY IN PIT session for he first 5 minutes. Since we noticed that you didn't join, we decided to do one more STAY IN PIT session of 5 more minutes to wait for you. We checked for any message from you in chat, before starting, but we haven't found anything at that time. We decided to start the qualification hoping that you could join with the qualification on the way. The first driver excluded from group A joined during the qualification. From the logs, I saw that it was 20 minutes after the SERVER UP, PLEASE JOIN message in chat. We thought you wouldn't come anymore, so when he asked if he could race we say yes. I can understand your disappointment, but after 20 minutes without any sign about you, we felt it was ok that someone else could take your place. Maybe this wasn't the right decision afterall. Maarten Steverink wrote: I missed this event, because i had some connection trouble and when i joined with 14 minutes of qualy to go, someone had taken my spot in group A. Not very nice, as i took some time off work to join you guys. Not amused. Thanks for the explanation, Andrea! Such a shame you made that decision, as i was 10 points ahead, and i am now in 10th place, 80 points behind. But i can see that you had to make a decision, although i indeed think it wasn't the right one. But things happen, can't change it now. Laurent, i would love to race against you again, so i wouldn't mind AT ALL if you joined the races that are left. Maarten Steverink wrote: Thanks for the explanation, Andrea! Such a shame you made that decision, as i was 10 points ahead, and i am now in 10th place, 80 points behind. But i can see that you had to make a decision, although i indeed think it wasn't the right one. But things happen, can't change it now. always very difficult to take an ongoing championship, it is a way to take and of laiser, if have it mark of big points, efforts of other pilots who they, participated in all race:twisted: , while is meme, have in nothing to win, since the win in this championship is impossible to us! but, no problem, Maarten, we shall have certainly the ocasion, would be what only on the server of RSR, to meet us for some good battles!!! Maarten can make it still on top 1-4 in champiionship, I think. Just some mistakes of drivers currently on top and he might be there at top again with enough points. At least he can make it onto 3rd pos. behind Gek and Orsetti. 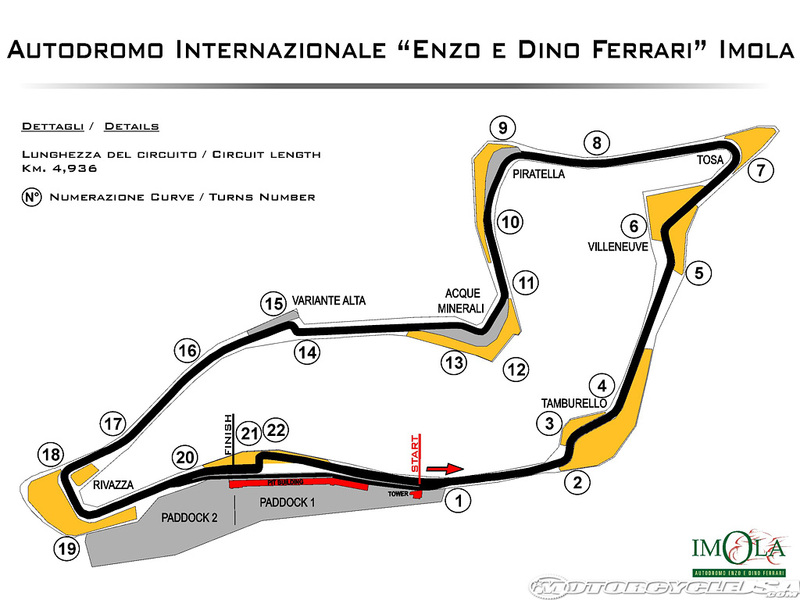 @Laurent: Why not join anyway, just do not mind the championship table that much.. , go for races and its results. Hi Laurent, I read your message too late. You are always welcome to join. It's always nice to have fast and clean drivers like you in the official races. Doesn't matter if it's just for few races. At the end the main reason for organizing a championship is to have fun together. The more, the better. Andrea Lojelo wrote: Hi Laurent, I read your message too late. You are always welcome to join. It's always nice to have fast and clean drivers like you in the official races. Doesn't matter if it's just for few races. At the end the main reason for organizing a championship is to have fun together. The more, the better. therefore ok I participate in next! i'm entered in qualify after 10" from end of session and during pit time before the race i asked to partecipate. I understand my mistake. Scusa Fulvio, il reclamo non è misterioso. Ne ho parlato in privato perchè di solito si fa così... Pensavo che sarebbe stato sufficiente che Andrea ti riferisse tutto, per questo non ti ho contattato. Anzi, se vuoi ti mando in PM la conversazione, nessun problema . Riguardo il pitlane speedlimit infraction, penso di conoscerne il motivo: sono entrato in pit lane a 50 km/h circa, anche perchè c'eri tu davanti e ho dovuto frenare parecchio e non ci tenevo a colpirti sinceramente . Sono entrato in 2a e la velocità si era stabilizzata sui soliti 79 km/h, ma nel momento del passaggio tra 2a e 1a la velocità è risultata per un attimo 80 km/h. Non ci ho pensato più di tanto sinceramente, ma a quanto pare risulta come infrazione . Ti mando il replay se vuoi. Comunque mi dispiace che tu la prenda così... E' stata una gara fantastica, personalmente una delle più belle che ho mai fatto proprio grazie alla sfida con te. Credo sia meglio continuare la conversazione in privato e chiarirci con tranquillità. Non ho nessun problema con te nè con nessun altro, dico davvero . Il giro che ti è valso la pole poteva farlo chiunque e io avrei reagito allo stesso modo. My Imola Fraps live recording is up, you all know where to find it (the link) . M Waechter wrote: My Imola Fraps live recording is up, you all know where to find it (the link) .